Mix ground flax with 6 tbsp water in a small bowl and set aside. In a large bowl, combine the dry ingredients, flour, baking powder, and salt. In a blender or with an electric mixer combine the flax seed mixture, milk, oil, and vanilla. Add the wet ingredients to the dry. Be sure not to over mix or you will end up with a tough and chewy waffle. Cook with a standard or Belgian waffle maker as directed by your maker. Made 5 waffles. 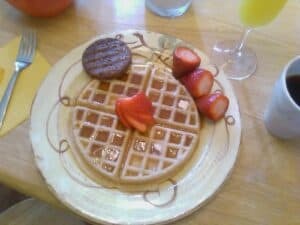 *If you like a lighter waffle, mix 1 cup white whole wheat flour and 1 cup white flour. 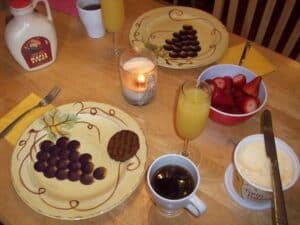 B served the waffles with coffee, mimosas, veggie sausage, and fresh berries! Enjoy your Sunday, go Vikings!